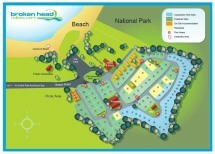 Broken Head Holiday Park have held their 3 and a half star AAA Tourism rating after an in depth park inspection earlier this month. AAAT STAR ratings are recognised as the most trusted symbol of accommodation quality. So to hold the star rating is a great achievement for the Broken Head Holiday Park and shows consistent quality and cleanliness. It’s only up from here!